Han Yan (CHN), after a disappointing fourth place finish at Slovenia's Junior Grand Prix, won the men's short program with 70.47 points. His tango program was effortless with a triple axel, triple lutz-triple toe and triple flip (wrong edge take off). He skated with natural flow and did a very good footwork that got a level four. His last spin, however, (a combo sit spin) did not receive any level and was counted as a zero. Maxim Kovtun (RUS) is just one point behind Han Yan (69.47). 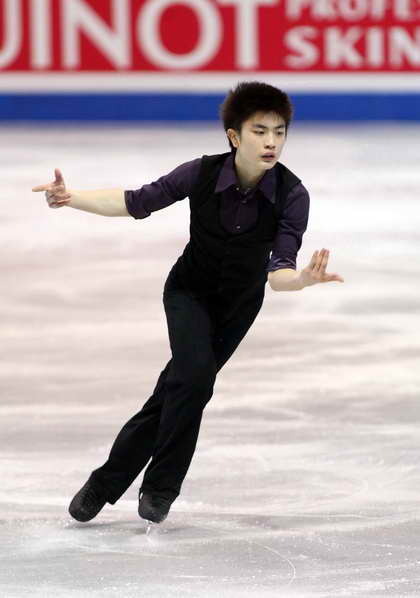 He performed exactly the same technical elements as the Chinese skater (including a wrong edge on triple flip) but lost a point on components score. Harrison Choate (USA) is in third place after the short program with 64.05. His jumping content was not very high (triple lutz-triple toe with a step out, triple flip and double axel) but the other technical elements were extremely clean and well executed (he received level four for all spins and footwork).